Today, 5 years ago, Marjolijn and I were married, in the Chapel of the Utrecht University Hospital. With us were all our closest family, friends and a lovely civil servant who led the ceremony. Why you may ask were we married there? We'll, after a long and careful consideration Marjolijn and I had finally decided to risk telling our parents that we wanted to get married. I say risk, because of the situation Marjolijn's father was in at that moment. He was seriously ill of cancer and had had a long fight with it, having good days and bad days. Planning the future was very much on a day to day basis, following and watching the progress or degress in the health of Henk, Marjolijn's father. At the moment we decided to set a date for our wedding, Henk had been very good for quite some time, so we were hopeful that everything could work as planned. We decided on getting married at City Hall, a very modern building in the midst of century-old buildings in the centre of Utrecht. Numerous exotic places had passed our thoughts, but fearing a sudden relapse in Henk's condition, we decided on a "safe" place. Time went by, Marjolijn's tummy was growing steadily (yes, she was pregnant with Casper at the time) and the date neared. I had asked Henk and Marianne for Marjolijn's hand and they had accepted my proposal for their daughter (after a long hard think ;-), he-he!). So we were all ready for the "big" date. Then, out of the blue, as was often the case, Henk became ill, very ill. The relapse in his condition was so bad he had to be hospitalized. And it didn't seem to be a short stay this time. As the 15th of December was closing fast, we asked the civil servant of the possibility to hold the ceremony at the hospital, if necessary. She promised to look into it. We held our breath, staying with Henk at the hospital on a regular basis. Which I must say was a weary situation, but a stay which Henk always tried to make as easy and pleasant as possible for us. Always joking, laughing and letting us know that we must live life to the fullest, enjoy it, and never fear the day of tomorrow. His attitude towards life and living inspired me to write a piece (an editorial for Link, Fimcap's bi-monthly international magazine), which I'd be very honoured with if you, our reader, have the time to read it yourself. 10 days before our wedding date, our civil servant called us to inform us that she'd had no luck in convincing neither the city nor the provincial government to let us marry in the Chapel of the Utrecht University Hospital. Rules were rules, if we wanted to marry in an "exotic" location this had to be reported to the City government 6 weeks in advance, and as we had failed to do so, the wedding was to be held as originally planned in the City Hall. She regretted the terrible situation this put us in - Henk would probably not be able to be present - but said she could do no more. Her hands were tied as her superiors had set their foot down. We had to tell our family the sad news. Luckily our family is of the resourceful kind, that doesn't lie down when something gets in the way. My father got very pissed when he heard about the situation (he has quite a temper that man! ), and decided to try and do something about the whole thing. 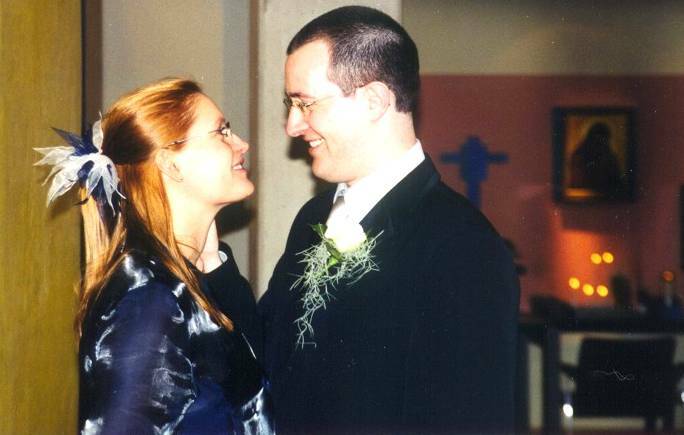 Don't ask me how, maybe you can ask him someday how he did it, but on Monday I got a call from the civil servant who was to marry us, that everything was set. Set for marriage in the Chapel at Utrecht University Hospital ;-) I was totally flabbergasted when I heard it, and asked how this was possible. She only said that the mayor had intervened and said that "rules cannot always be rules - they are there for 95% of the normal situations, for the other 5% there has to be another way". It was not a case of looking the other way; it was more a case of interpreting the rules in such a fashion that certain occurrences could be dealt with accordingly. The whole thing had made such an impression in the City government that we even received a letter on the matter, apologizing first and explaining later about the whole matter. "Your story will be used as an example when not to enforce the rules of the City government, but to use leniency when the situation asks for it," the letter stated. 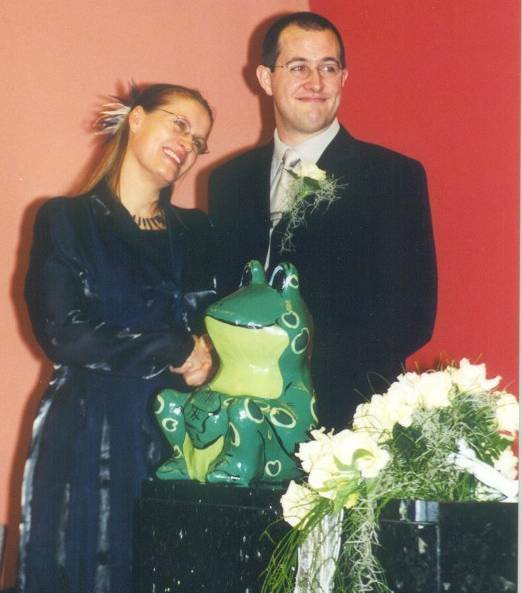 So on the 15th of December 2001, Marjolijn and I got married, finally together for real, celebrating this joyous occasion with all of our parents (Henk was there in his hospital bed, all dressed up), our brothers and sisters, grandparents and close friends and relatives. We exchanged the rings we had fallen in love with at first sight, then spent 7 months trying to find another pair to match it and claiming that "love at first sight might be too hasty, let's look around for a while", but eventually ending up at the same jeweller as we had started out at, buying the rings we liked so much. Henk held a lovely speech, as did my father; we cut the wedding-cake and had a wonderful time at the hospital. Around two hours later we said goodbye to Henk, too sick to accompany us home to Marjolijns' parents' house, exchanged hugs and lovely words, and left for the wedding party. We ate, talked, feasted and danced until the wee hours, coming home very late. Our best men and women (Marjolijn and I both had two, as we couldn't choose) stayed the night and together we had a very nice brunch at our home in Utrecht, at the Makassarstraat. I've never actually written down the events as they happened before, but feel good having done so now. It's a remembrance of Henk and his struggle to be with us, our struggle to have him with us, and my fathers struggle to make this all possible. But most of all it's a story of two people in love, wanting to get married, and everyone around us trying their darndest to make it all possible in the end. We'd like to thank you all for this day you gave us, and hope to have you with us for a long time, in this world or in the next, but always in our minds and in our hearts. Post a comment on "Happily married"